Some good news for Internet Explorer users. 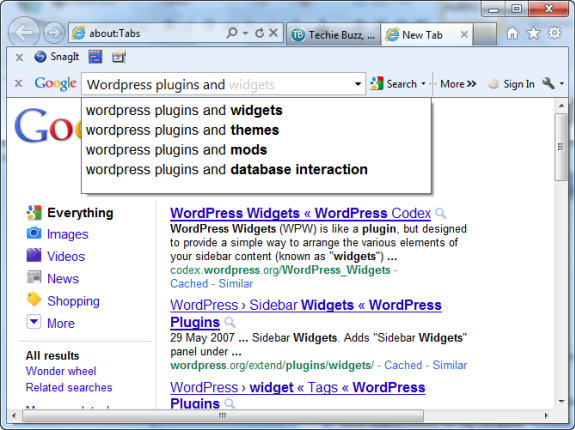 Google has recently released a new version of Google toolbar for Internet Explorer and Firefox. 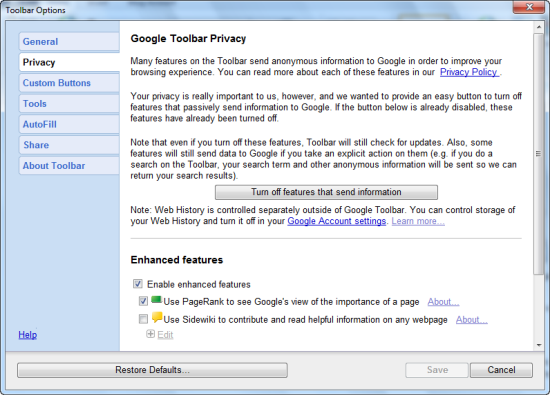 Google Toolbar 7 making your web browsing faster, simpler and “instant”. After you have downloaded and installed Google Toolbar 7, you will be first asked to choose your default search provider. 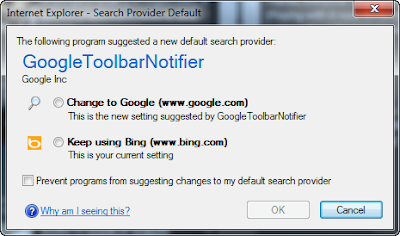 You may either choose Bing or Google as your default search engine, hit “OK” and restart the browser for the changes to take effect. Once you have turned on Instant search for Internet Explorer 9, you can preview search results on Google.com by typing the keywords on the Google search box of Google Toolbar. Since I am a regular Google Chrome user, I confused this with the address bar of Internet Explorer only to find out that I have to type the same words in the Google search box of Google toolbar (and not in the address bar of Internet Explorer 9). You can also type Alt+G to get to the Toolbar search box more quickly. To clear your search terms, hit the “Escape” key on your keyboard and the search box will be highlighted, waiting for you to type the new keywords you want to search for. With this new update, Google wants to push their instant search features deeper and let IE users get the feel of “Instant” search without having to use Google Chrome at all. 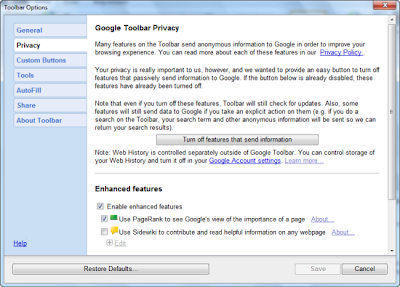 Many features in Google Toolbar send anonymous usage information to Google, in order to improve your browsing experience. Other features are quite the same as before, it’s just that Google has revamped the overall look and feel of Google toolbar by removing unnecessary UI clutter of buttons and icons from the toolbar panel. To customize which buttons and options appear in the toolbar panel, click the “wrench” icon, go to “Custom buttons” and choose the buttons you want to see in the toolbar area.